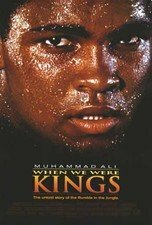 Academy Award-winning documentary chronicling 1974's "Rumble in the Jungle" bout that saw Muhammad Ali regain the heavyweight title from George Foreman. Along with exciting boxing footage, director Leon Gast captures the charismatic Ali at his jive-talking greatest, the fight's incredible hoopla and commentary by Norman Mailer, Spike Lee and George Plimpton. 94 min. Standard and Widescreen; Soundtrack: English Dolby Digital stereo; Subtitles: Spanish, French.